Vladimir Potanin is the first Russian entrepreneur to join the Giving Pledge initiative of Bill Gates and Warren Buffett. The CEO of Interros, Vladimir Potanin, will join a list of nearly 100 wealthy people who have promised to give half of their wealth to charity as part of the Giving Pledge program. Potanin claims he wants to give away his fortune, because he wants his heirs to be motivated to achieve things on their own. Vladimir Potanin is the first Russian entrepreneur, together with 11 other philanthropists from around the world, to join Giving Pledge — the global initiative of Bill Gates and Warren Buffett. Until now, only U.S. businesses were represented. Giving Pledge was founded in June 2010 by rich-list leaders and old friends Buffett and Gates, to "prompt the world's richest people and their families to donate most of their fortunes to philanthropy." By February 2013, ninety-three billionaires had joined the campaign, which requires committing at least 50 percent of their wealth to charity. They include Michael Bloomberg, David Rockefeller, and George Lucas. "I am joining Giving Pledge because it is an outstanding initiative worthy of support. I hope that my example not only announces the revival of philanthropy in Russia to the world, but inspires my compatriots and others to do likewise," Potanin wrote in a letter to the organizers of Giving Pledge, according to the Interros website. In the spring of 2012, Forbes magazine estimated Potanin's fortune at $14.5 billion, ranking him fourth on the list of Russia's richest businessmen. According to the Bloomberg Billionaires Index, which gives a daily ranking of the 100 richest people in the world, Potanin is currently in 52nd place with $15.4 billion (and liabilities of $1.5 billion, notes Bloomberg). Potanin now personally controls his assets through Interros. Some profits are reinvested and some are used to fund approved charity programs. The businessman's press service said that a special trust would assume the management of his assets in the future. Potanin's charitable activity began in 1999. 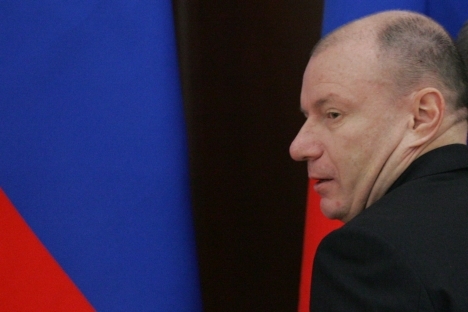 The Vladimir Potanin Charity Fund now donates roughly $10 million a year to education, culture, and sport. An example is the businessman's active support of the Hermitage and Guggenheim museums. Three years ago, Potanin announced his intention to give his fortune to charity. The reason is simple: he wants his heirs to achieve everything on their own. "During my years in business, I have come to the clear realization that large wealth is above all a big temptation, a test and a heavy burden for heirs. They are in the shadow of their rich and famous fathers, and they have little motivation in life — because they seem to have it all already... So I believe that leaving a demotivating fortune to children is wrong. If you want to make your kids happy, give them a million; but if you give them a billion, you'll destroy them. Because in the latter case, your kid will think: 'That's all, my life is over now, what more can I want?' That's exactly why I decided not to bequeath my capital, but to leave it in a charitable trust," he wrote in his column in Forbes. The news received a mixed response from his compatriots. "If the man who built this empire does not see its future in the hands of his children, or wants them to make their own way in the world, it's logical to give the money to charity. It's another matter that the money could be used to solve many of Russia's domestic issues," says Alexander Gafin, a member of the board of directors of Rietumu Bank. "I don't think Potanin trusts the national system of governance and believes that a Western fund would be more reliable."